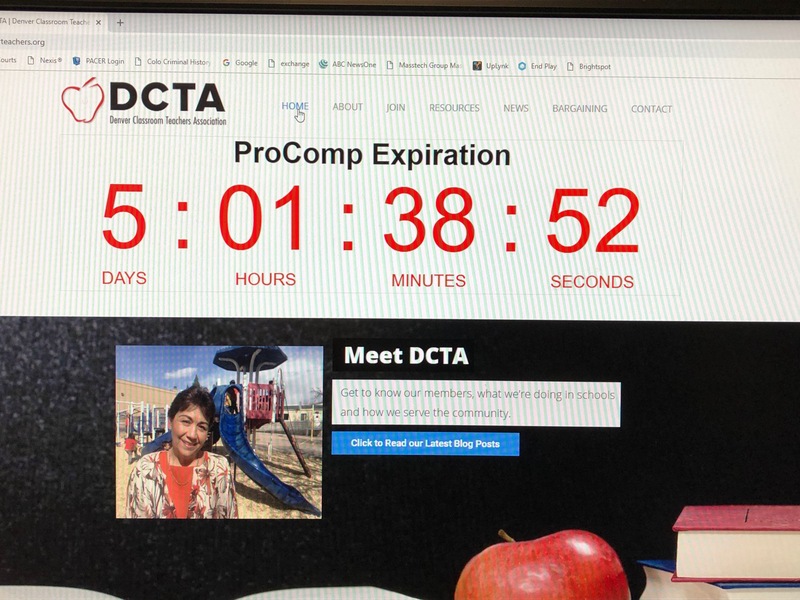 DENVER — The clock is winding down on negotiations between Denver Public Schools and the 3,400 member Denver Classroom Teachers Association. Three more negotiating sessions are scheduled this week: on Tuesday, Thursday and Friday. Superintendent Susana Cordova said she's optimistic an agreement can be reached, as long as both sides come to the table "with a disposition to dialogue." DCTA's lead negotiator, Rob Gould, is less optimistic. "I can't think of a time that's been more critical in the last 21 years that I've been teaching," he said, adding that it's very difficult for many teachers to make ends meet, with skyrocketing living costs. "I'm considering leaving the profession," said Rebecka Hendricks, a math teacher. "I would like to be at a point where I don't have to live with a roommate, where I can start thinking about having a family, and with the salary that I have now, I can't do that." Hendricks recently moved to Lakewood. She said the only apartment she could afford in Denver was off Colfax, and that it had a leak in the ceiling, and a frequently clogged sink. "At one point the landlord told me I could go up and do dishes in my bathtub," she said. "It got to the point where if I wanted to stay in Denver, I was either going to have to stay in places like that, or I needed to (move) outside of Denver." Hendricks said when she lived in core city, she had to have multiple jobs. "That's not good for our students — to have teachers that are exhausted, not only from the teaching job they have, but from the extra jobs they have just to survive," she said. As DCTA's top negotiator, Gould said union members don't feel DPS is doing enough to address their concerns. "In fact, it's been a long line of not doing enough, over a lot of years, and that's why we're in the boat we are now," he said. Cordova said they all agree that they need more money in Denver's public schools. She said DPS is doing everything it can with the budget. The real problem, she said, isn't with DPS, but with the way the state funds schools. "Colorado is significantly below the national average," she said. "(With Tabor,) we actually refund money to our taxpayers instead of funding our schools." Gould agrees, but adds that DPS needs to change priorities and quit wasting money. He cited a bloated central administration, an excessive amount of new programs and too many failing charter schools. "I would rather, instead of them going in and spending money on what's the next great shiny thing we need to do, I would much rather they take that money and use it to keep teachers in Denver," he said. Gould suggested closing charter schools that aren't performing, and paring back central administration. Cordova said tough choices are being made, but they have to treat every student fairly. "We embrace all of our kids as the kids of Denver," she said. "We serve them all equally, and we think it's important that all students in Denver have access to the resources that public schools should offer, and that's something I believe deeply in." She added that every school -- charter and public -- should be given ample time and resources to succeed. "If they don't, then a change can be made," she said, adding that DPS has closed as many charter schools as public schools. Cordova also said that cuts will be made to central administration. "This is about making choices," she said. "Some of the choices are going to be challenging, because everyone in central administration is working in support of our schools, but we have committed to invest in compensation for our teachers and that will come out of central administration." Cordova said DPS has put $23 million into the teacher compensation proposal. She said $7 million of that will come from paring back central administration. "We'll have 600 teachers, with our proposal, who could go up by $10,000," she said. "I think that's a lot to be optimistic over." Gould said what DPS is proposing "doesn't always add up." He said in addition to "more money in the pot," teachers want more ways to move through the salary schedule, without having to acquire a Masters degree or PhD. "Teachers are working 60 to 80 hours a week," he said. "Many don't have the ability, or the time, to get a Masters." Cordova said there is a pathway to $100,000 in base pay that doesn't include incentives. WIth the district's proposal, the average salary would go up by 10 percent, she said. But Gould said the only real way to move through the salary schedule is to be in Denver Public Schools for 10 years. Hendricks told Denver7 that teachers don't want to go on strike, but have been told to save money in case there is one. "Nobody wants to strike," Gould said. "But I think we're at the point now, where we've been talking to the district for so long, if they don't listen to those ideas, I'm afraid there will be one." Cordova remains optimistic that an agreement can be reached during the three remaining negotiating days. "I think it's important that we come to the table, both DPS and DCTA with the disposition to dialogue," she said. "We have 92,000 kids in DPS and many of them are counting on us to do this." Both sides are thanking the community and appealing for its support. Then-Gov. Roy Romer intervened to help break an impasse over decision making authority. There were only 62,000 students in the district back then. Gould said they'll continue to negotiate this week, "and on Saturday, wherever we end up, if it's something we can recommend to teachers, we will. If it's something we just bring to the teachers and say, 'Here's what it is, you make the decision' — that's what's going to happen." He added teachers will actually vote on Saturday, if they get that far. "They'll either vote to ratify it or vote to strike," he said.